Edinburgh's Meadows provide a green open space to the south of Old Town, opening up stunning views across the Old Town skyline to Arthur's Seat, Salisbury Crags, and around to Bruntsfield Links. It's a much loved and much used part of Edinburgh, and a space for reviving and uplifting the spirit. Our Meadows candle captures the fresh essence of these wide open spaces using clean scented lemongrass essential oils, and a little lavender distilled straight from the plant. Aromatherapists believe that lemongrass gently boosts your energy and relieves stress. Lavender has been used as a fragrance for thousands of years and offers a relaxing aroma that combines beautifully with the lemongrass. The 85g size tin is ideal for taking the freshness of The Meadows with you when you travel. The fragrance of our Meadows candle is the perfect pick me up. Hand poured from soy wax with a burn time of approximately 20 hours. Comes in a little tin, but is also available as a medium and large glass tumbler. This April we are giving away the chance to win £120 worth of our Scents of Edinburgh candles every time you purchase a small candle tin online. 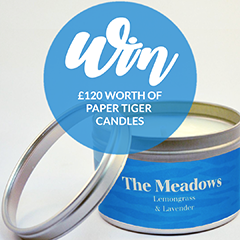 The Paper Tiger Scents Of Edinburgh scented candles and diffusers are 100% natural, and are made from plant based soy wax. They are scented with natural essential oils, and hand poured in Scotland. The prize includes six large scented candles, one of each of the six main scents, and will be shipped to you for free. Enter as many times as you like online. Winners will be announced on April 30th.